I looked over the side of the boat at the crystal clear waters of Mathew Town Great Inagua. A smile slowly crept upon my face, I was finally in the Bahamas. Dad and I climbed into the dingy with the red file in hand and putted ashore to a dock were we could tie up. The walk to customs was about fifteen-minutes although it took us about 20 minuets because we didn't know were to go. The customs man was probably one of the most friendly we have ever seen, he asked us if we needed anything and directions to get there. The Bahamas are very expensive because most of the produce is imported. The Bahamian money is very pretty the coins not only being round but also square and wavy. Greate Inagua is famous for it's towering salt mountains and flamingoes. That night a full moon illuminated the water and with it's light we saw many tropical fish swimming in and around the coral heads below us. Great Inagua is also well known for The Bahamian parrot, unique only to some islands of the Bahamas. Dad deployed the anchor into yet more crystal clear Bahamian water, this time in Man of war Bay. The dingy swiftly slipped into the water and this time Mom, Jack and I went ashore to the ruins of a lifeguard station and deserted beach. As we were about to beach the dingy two Thresher sharks swam past the dinghy. Jack tried to launch himself into the water. The complication to this was that I was still holding on to his tail. He was half in the water and splashing around like crazy. The sharks felt the action and quickly darted towards us. I managed to pull Jack into the boat and not a moment too soon. What I find amazing is how quickly I pulled Jack into the boat. When we beached the dinghy I let Jack go so he could stretch his legs. I forgot that Jack, loving the water would immediately go towards the sharks and he did. He must have been very exited and actually chased the sharks away. There are three things I will surely remember about Man o War bay. The sharks no surprise there, the thimble sized sea biscuits and all the left foot sandals. Yes along the beach at the high water mark, hundreds and hundreds of left foot sandals. What I can't figure out is why there weren't many right foot sandals. We left Man O War bay 2 pm Thursday 22nd February 2001. Turquoise water shimmering in the sunlight gently lapping the beige coloured beach with little pink, yellow and green houses silhouetted against the pale blue canvas of the sky. This is my memory of Landrail Point Crooked Island. A constant sound of imaginary music fills the air. Even the monster stingray lying on the sandy bottom, with one eye half open watching lazily as trunkfish swim around it. The only aquatic animal doing any work is the multicolored octopus constantly collecting odds and ends for its lair, the oceans Magpie. Small fish make their homes in the shells of dead conch. An eel twisted and twirled around it's home in a sea biscuit. He is dressed up in a black tuxedo with yellow spots and yet he has nowhere to go. Instead he makes use of his clothes and weaves in and out of his home like a tapestry being created. The sun was shimmering in waves through our blue shade cloth awning at Conception Island. The water was as flat as glass and I gently slipped into the water. Cool water lapped against my chin as I adjusted my mask. I took a breath and dove down to the bottom. 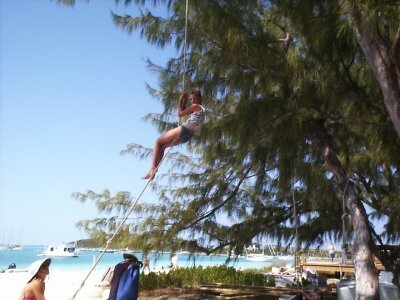 Exhaling air, I was able to lie on the soft white sand watching a stingray watching me in the shadow of Gilana's hull. I never realized how protruding stingrays eyes were until I was lying next to one. 2 'o' Clock came and it was now cool enough to go ashore and explore which is what I try to do at every place I go. The beach, well how should I begin, it is littered with pansy shells and small pieces of shells. At the end of the beach there are some stunning rock formations because the cliff face is made out of sand stone. The wind and sea erosion cut and craft caves caverns and paths for the wondering traveler. Walking by the sand stone you can avoid the sharp rock known as rip your feet coral. Conception Island is a nature park yet still people kill Conch. Swings that are draped over branches on Volley Ball Beach, George Town sway gently as they get caught in the occasional breeze. Time slowly creeps on to two o'clock, by five past two the beach is filled with children as Children's Day begins. A "Quarter Hunt" starts the day, children dart this way and that in the sand uncovering buried treasure. Next "Water Balloon Volleyball" gets everyone wet. Two people hold the ends of a black garbage bag, a water balloon is placed in the middle of the bag, jerk the bag and tension is released as well as the water balloon. In this activity everyone gets wet. Grab your home made sail boats and head for the water it's time for the sail boat regatta. Following that is the potato sack race, every one is familiar with this race and watching your friends hopping around like made is hilarious. The three-legged race happens when you tie your right and your friends left leg and try to work in rhythm very funny and exhausting. The pudding eating contest is probably one of the most messy, I got second place but no prize except eating the chocolate pudding, egg tossing is also lots of fun, you have to toss an egg to your partner, each time you or your friend catches the egg you take a step back. If you drop the egg you are disqualified. The second last activity is the water-pouring race, you have to pour water from cup to cup along a line to the end person who carefully pours the water into a gallon jug, and I was that person and my team won. After all the sports you are really messy so its off to the sea to rinse off. Afterwards it was face painting and tug of war to pull the last bit of energy out of your body. When this is over you collapse on a bench under the trees and have your face painted. There is always something happening in Georgetown. One day we built a bridge of dinghies across the bay and passed the Bahamian flag across from one end to the other as a tribute to the opening of the regatta. Even when the Regatta was over and a lot of the boats had left we still had fun. One night there was a lip sync contest, which was very funny, and would you believe a Conch blowing contest. We had an extra crewmember when we left Georgetown, Chris, who won a Valentine's Day Competition for a voyage on a sailboat. People now call her competition a perfect storm not a perfect voyage. Anyway we left a few days later bound for Little San Salvador, another island in the Bahamas. Clear water, long white beach and rock hopping yes you guessed it Little San Salvador. During the week this peaceful little island is deserted and offers sailors a perfect place to go snorkeling walking climbing or even biking. We went rock hopping around the coast of the island for the whole day, stopping at little caves and bays where we have a rest. As it happens in one particular bay there was a sailboat that must have been wrecked quite a while ago because the entire boat was buried under the sand, excluding maybe two foot of the mast, which was sticking out. The snorkeling on the reef is good and around the scattered coral heads there is a halo of turtle grass, and around that sand dollars galore. North Bimini, probably a very nice anchorage with good holding and great diving like many other Bahamian islands. Unfortunately we arrived in a storm and for the few hours that we were there we didn't look around much we just had a quick snorkel to dive in the anchor and spent the rest of our visit inside reading and preparing for our midnight crossing through the Gulf Stream and into America the land of the brave and home of the free, or is it the other way around. We left Bimini at midnight or so I think for I was asleep and unfortunately didn't get to say goodbye to the Bahamas, oh well! All the water that gets carried into the Caribbean basin has to escape somewhere, right? This place is around the western tip of Cuba, the water rushes up and around Cuba flowing rapidly between the South- East coast of Florida and the Northern Bahamas. Turning east around Cape Hatteras, heading for Europe where it dissipates, bringing warm water from the Caribbean. Luckily for us the Gulf Stream was helping us north, up to Singer Island, West Palm Beach, Florida. Depending on winds and tides, the Gulf Stream travels at different speeds reaching 3 to 4 knots. The position of the Gulf Stream also changes and is sometimes recorded only three miles off the coast of Jupiter.